Jeff and Lisa Landburg are the owners of Pool Creations, Inc., a company that specializes in custom gunite swimming pools. Jeff has always had a strong interest in owning his own company since the early 1980's when he was construction manager of a master pool company. Founded in 1998, with a pickup truck and a shovel, the Landburgs left "corporate America" behind and stepped out on a leap of faith to follow their dream. 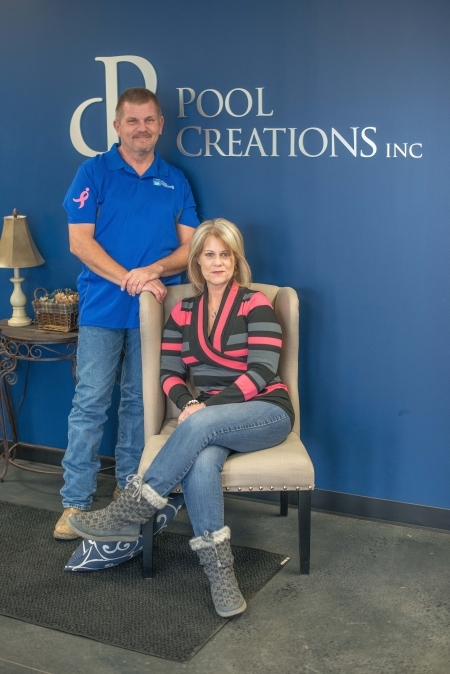 With Jeff's background in business and pool construction along with Lisa's background in business and finance, the Landburgs have made that dream a reality. Based out of Catoosa, Oklahoma, this family owned business is proud of their reputation for building a quality swimming pool and insure that each customer is fully satisfied knowing that the product that is promised is the product delivered. Voted Best of the Best by Oklahoma Magazine four years in a row.